Fully loaded and ready for action! Roy Scheider stars as a courageous police officer pilot battling government fanatics planning to misuse an experimental attack helicopter. Chosen to test Blue Thunder, Frank Murphy is amazed by the high-speed high-tech chopper. It can see through walls, record a whisper or level a city block. 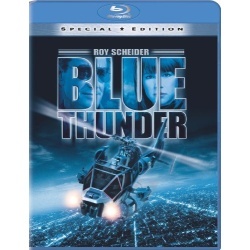 Distrusting the military mentality behind Blue Thunder, Murphy and his partner Lymangood soon discover that the remarkable craft is slated for use as the ultimate weapon in surveillance and crowd control. Jeopardized after being discovered by sinister Colonel Cochrane, Murphy flies Blue Thunder against military aircraft in a spellbinding contest over Los Angeles.